We are approaching the fourth year of the current economic expansion and there remains a meaningful amount of doubt and lack of confidence. These doubts have been fueled by a high (but declining) unemployment rate, worries about a possible “double-dip” recession, and of course, the European debt crisis and U.S. fiscal cliff. This is not surprising given the breadth and severity of the last recession and the fact that there are no quick fixes to the fiscal problems in the Eurozone and the United States. Unfortunately, the negative moods and corresponding negative news headlines have prevented many from fully appreciating how far the economy and markets have come. 2012 was another positive period for economic fundamentals, and 2013 should see continued improvement. 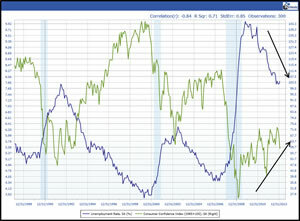 The chart to the left displays the Unemployment Rate (blue line) against the Consumer Confidence Index (green line). Click it for a larger view. 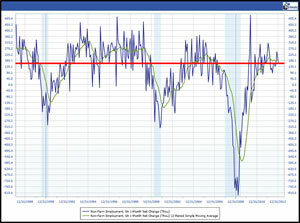 Historically, there has been a very strong negative (opposite) relationship between these indicators. 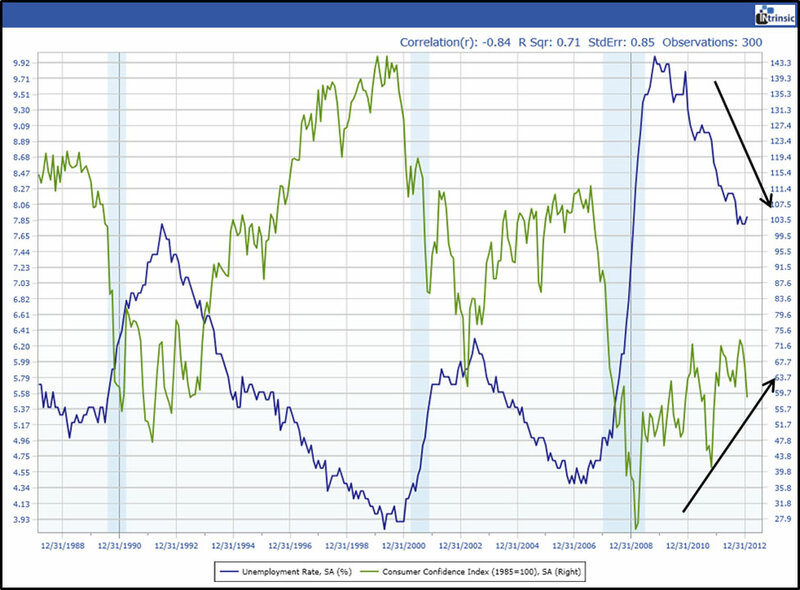 As the unemployment rate declines, consumer’s confidence has increased and likewise a rising unemployment rate brings lower consumer confidence. The unemployment rate continued to decline in 2012, and we expect it to continue to trend lower in 2013. Similarly, we would also expect consumer confidence to improve. Why will this happen? The primary answer is that statistically the economy is producing monthly job gains very similar to the previous two recoveries/expansions. This chart (click for a larger view) shows the month-to-month changes in employment for the last 25 years. Over the entire period, the economy has produced a median 147,000 jobs per month. During 2012, the economy produced a median 165,000 new jobs per month. This is consistent to the number created at the same point in the 1991 recovery and better than the 2001 recovery. Rising consumer confidence should fuel additional stock market performance. Traditionally as Consumer Confidence rises, the valuation (Price to forward Earnings) of the S&P 500 has improved. This is likely to be the next driver for the stock market. Since the summer of 2009, the S&P 500 forward earnings have increased 68%, and the price performance has improved a similar 68%, causing the valuation to remain unchanged at about 14x. Further gains in employment will likely lead to rising consumer confidence. This improved confidence should result in higher stock valuations and further stock price appreciation. Likewise with improving employment conditions, this should become an expansion to gain confidence in. As always, we remain focused on understanding the current trends in fundamentals because it gives us the best probability for success. And if you’re an active social media user, please consider sharing this topic with your acquaintances.